The Certificate of Dedication can make a very special event even more special. You can utilize this certificate when your church member (adults, babies, etc.) dedicates their life and accepts Jesus into their heart as their personal Lord and Savior, and when you acknowledge them at this special time and dedication by awarding them with a certificate. This certificate from their church will always be a special reminder of the date and time that they gave their life to Jesus as their Lord and Savior. This is a date and time that they will never forget, but this certificate will be a visual reminder of that special day. When presenting this certificate to the person(s) making these dedications your church can show their honor and appreciation for them. Many churches use these beautiful certificates to show their appreciation and honor, and the members receiving these certificates feel special knowing that they are being recognized at this special time in their lives. 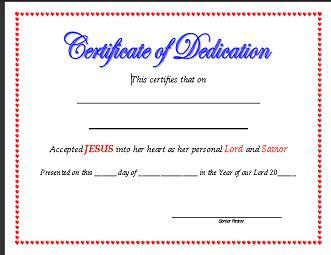 The certificate can be inserted into a simple sheet protector to preserve the certificate or you can even insert it into a picture frame to make the certificate look even more official, and also gives the person(s) dedicating their life to Jesus as their Lord and Savior an incentive to hang on their wall at home. The certificate can be downloaded and printed on copy paper, resume paper or stock paper in the color of your choice. You also have a choice of a printing company printing your certificates or printing them yourself. In some cases, depending on your printer, it may be cheaper to print them at a printing company. Return to Free Church Certificates from Church Dedication.